Read on to learn how to configure load balancing deploy the WSO2 API on Amazon ECS using a single container with an all-in-one profile. At WSO2 we have been mostly using Kubernetes and DC/OS for deploying WSO2 middleware on containers in production. While those can be run on any public cloud platform some users may prefer to use Amazon’s own container cluster management platform, EC2 Container Service (ECS), due to various reasons. Very recently we evaluated ECS on running the WSO2 API Manager on it with Docker. 2.8 Review the configuration at the final step of the wizard and create the load balancer, target group, and the security group. In the above sample, registry hostname is “610968236798.dkr.ecr.us-west-1.amazonaws.com”. Similarly, if any other configurations need to be added to the API-M container such as data sources, clustering configurations, etc., copy those configuration files from the product distribution to the above conf directory and set the required values. Afterward, add the container to the task definition and create the task definition. In this article, the WSO2 API Manager was deployed on Amazon ECS using a single container with an all-in-one profile which includes the API Publisher, Store, Key Manager, Throttling Manager, Gateway, Message Broker, and CEP in one JVM. In this deployment, the ECS service will auto-heal the container by scheduling another container via ECS tasks if the existing container fails to respond. This process can be verified by stopping the current task forcefully via the ECS console. As I found currently ECS services only allow to map one port of a container with an ELB. 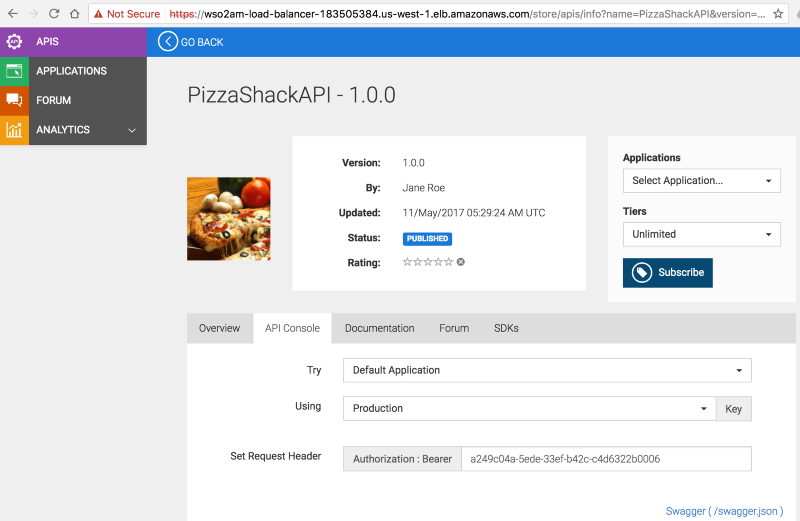 Therefore, the API Publisher and Store UIs were exposed via the API gateway. In a production deployment, if needed, the API Manager components can be run in separate container clusters and scaled separately.